Our Indoor Pistol Range is open 24 hours a day. All members with a valid "Membership and Range Card"may use the INDOOR range. Target distance is 50 feet. The Outdoor Pistol Range is open to all calibers, however, .22 rimfire ONLY is allowed before 9:00 am. Hours of operation are 8:00 am to sunset Monday to Friday, 9:00 am to sunset on Saturday and 10:00 am to sunset on Sunday. Rotating targets at a distance of 25 yards and static targets are at a distance of 50 yards. 1. Shooter shall be safe, courteous and shall at all times behave in a sportsman like manner. No aggressive and/or threatening behavior will be tolerated at any time. Such misbehavior can and will result in disciplinary action or expulsion. 2. No member will use the indoor range for center fire before being qualified by Tom (see below). Qualifying members may only shoot up to their qualifying caliber. Rimfire ammo (.17 and .22) can be used by any member with an indoor range card. 3. Only mid-range loads are allowed. Jacketed and Magnum ammunition is strictly prohibited. 4. ONLY paper targets may be used and attached to the supplied frames. 5. Calibers larger than .45 and all black powder firearms are excluded from the indoor range. 6.Guests may shoot only .22 rimfire on the indoor range unless under the supervision of a club range officer. 7. Eye and ear protection are required at all times. 8. Absolutely no shooting from in front of the designated 50 ft. line. 9. Firearms must be pointed in a safe direction (downrange) at all times. Tom will be conducting the qualification test for the indoor range, by appointment only. Please call the club to leave your name and phone number if planning on making an appointment. 1. Children aged 12 and over may shoot 22 pistol under the direct supervision of a licensed parent or guardian. They are to load one round at a time. At age 18 they may load 22 and centerfire handguns with 5 rounds, but no magnum loads. 2. Shooters shall be safe, courteous, and shall at all times behave in a sportsman like manner. (2a)No aggressive, and/or threatening behavior will be tolerated at any time. Such behavior can and will result in disciplinary action, or expulsion. 4. There shall be no pistol or revolver shooting at a range greater than (50) yards. 5. No smoking while shooting black powder. 6. Guests may shoot under the direct supervision of a member. (6a)The member may not shoot while the guest is shooting. 8. Absolutely no shooting from in front of the firing line. 9. No one is allowed forward of the firing line while shooting or handling of firearms is in progress. 11. Absolutely no ground level targets, cans or bottles are allowed. Paper targets only. Target frames are set to proper height to insure safe bullet impact at the backstop. 12. Semi-automatic handguns shall be loaded with no more than (5) cartridges. 13)Movable wooden targets on the outdoor range are confined to ports 1 through 15. Metal target holders are only allowed from port 16 and beyond. Red signs are posted. 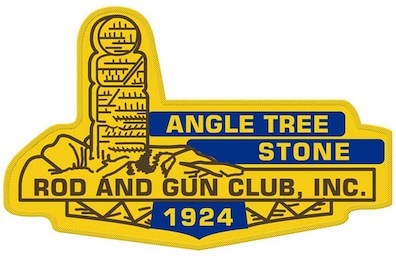 Indoor Pistol League: Angetree is a member of the South Shore Pistol League. The members compete at home and away with other members of the league. - We shoot the National Gallery Match with .22 Caliber handguns. - The top five scorers give the team average for the shoot. Click here for brief definition of 1800 and 2700 matches.